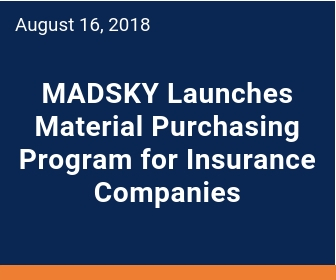 ENGLEWOOD, Colo., August 16, 2018 (Newswire) -Today, MADSKY officially launches Material Purchasing Program which provides a six percent discount to insurance companies on roofing materials needed for homeowner claims. For the past year, a few insurance companies participated in a pilot program that reduced their claim costs associated with roofing materials. With prices of roofing materials up six percent from this time in 2017, according to U.S. Bureau of Labor Statistics data, MADSKY'S program helps offset the increasing roofing material costs. "It is indeed a simple process that everyone can benefit - the insurance company, roofing contractor and homeowners nationwide." LC Nussbeck, founder and CEO OF MADSKY. The program is open for all insurance companies and is easy to integrate into their established claims process. The Material Purchasing Program is the latest edition to MADSKY's service lineup which includes interior or exterior inspections, managed repair and direct repair programs for the roofing industry.